Quarries have come a long way from the days in which outgoing loads would be guesstimated for amount of material and charged accordingly. Accurate weigh scales and ticket systems have helped, but there are still many potential points where efficiency can be reduced or costs can be inflated due to errors - and plenty of potential irritation to be had for drivers, loader operators and management. "Generally, information - product and tonnage to be loaded - is passed either on a two-way radio to the loader operator, or shouted across from the truck driver to the loader," Thomas described. "These instructions can be rounded or estimated, and the entry time of the truck is unknown so it's difficult to know whose turn it is." Slower cycle times and longer trips for trucks occur, and there may be mixups with material - which is a problem when a more expensive product leaves the quarry or the material that reaches its destination is wrong for the job. Trimble's LOADRITE 360 system, for example, can be a key piece of the puzzle, helping bring numerous pieces of technology within the quarry site together and help streamline data while safeguarding the operation against some of the common problems that may crop up. "We basically install a server on site that's connected to the customer's point-of-sale software," Thomas explained. "Both talk to each other through API, and then from the server to the payload we use a radio modem." "This brings the operator simplicity - clear and precise instructions coming directly onto his payload system - and it eliminates discrepancies between them and the truck drivers," Thomas said. "Operators aren't reacting to immediate stress - they have full visibility of how many trucks are on site, where they are and how long they've been there. Loading tasks can be rationalized and easily improved," he said. 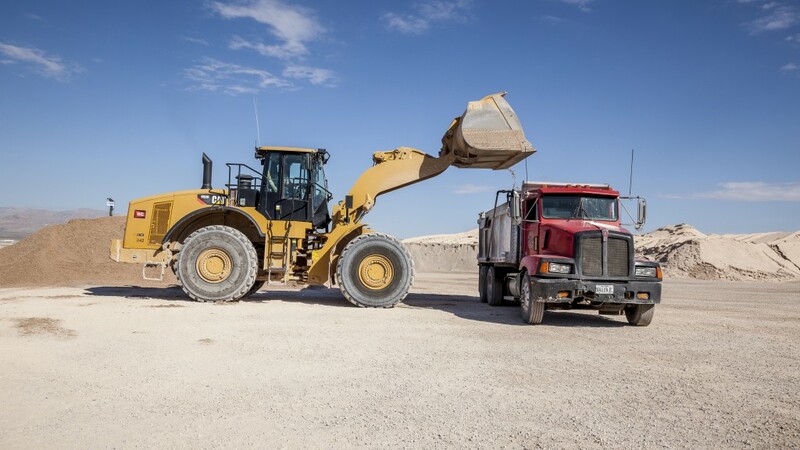 "It also improves stockpile management and loader task management; all information going into the payload system is coming from the quarry point-of-sale software, so they are reliable and not reliant on operator selection." The company re-evaluated its approach and instead moved to a kiosk system at the entrance to the quarry. There, the truck driver could generate his own ticket with the type and amount of material required, which would be sent directly to the loader operator's system. The truck would move to the loader, get the required material loaded up, and head out without waiting or weighing out. In the end, the producer was able to keep all of its smaller quarries operating thanks to the cost savings. In a third example, a large aggregates producer was having problems with product errors and weight challenges. Adding LOADRITE 360 to its system helped the producer turn its workflow around - literally. Instead of a weigh bridge at the exit of the quarry, it was moved to the entrance, allowing for correct taring in of trucks; from there, a legal for trade LOADRITE scale was used to load out, using the product and weight information sent by the 360 system. "Today, most sites are simply receiving trucks as they come in, being reactive. The improvement can come from the capability to anticipate truck visits and link those sales to the production site," he said. "We can install telemetry onto trucks that are moving around the quarry, and when they come into a perimeter - let's say 10 kilometres from the quarry - we can automatically notify the quarry's point-of-sale software. If the orders have been entered the day before, these loadout instructions can be pushed to the loader directly just as the truck drives in." Adding such automation to a quarry's operations is relatively easy, Thomas added, and the benefits are immediately noticeable. "Everywhere we implement this, the happiest person in the place is the loader operator," he said. "He gets simple and precise instructions that come up in the display when he needs it. It cannot be simpler."